Even better cryonics – because who needs nanites anyway? Abstract: in this post I propose a protocol for cryonic preservation (with the central idea of using high pressure to prevent water from expanding rather than highly toxic cryoprotectants), which I think has a chance of being non-destructive enough for us to be able to preserve and then resuscitate an organism with modern technologies. 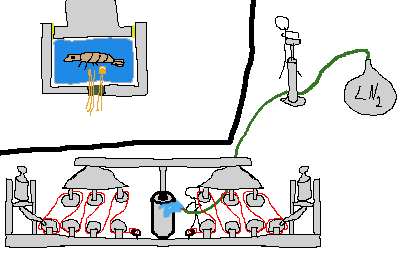 In addition, I propose a simplified experimental protocol for a shrimp (or other small model organism (building a large pressure chamber is hard) capable of surviving in very deep and cold waters; shrimp is a nice trade-off between the depth of habitat and the ease of obtaining them on market), which is simple enough to be doable in a small lab or well-equipped garage setting. Are there obvious problems with this, and how can they be addressed? Is there a chance to pitch this experiment to a proper academic institution, or garage it is? I do think that the odds of ever developing advanced nanomachines and/or brain scanning on molecular level plus algorithms for reversing information distortion - everything you need to undo the damage from conventional cryonic preservation and even to some extent that of brain death, according to its modern definition, if wasn't too late when the brain was preserved - for currently existing cryonics to be a bet worth taking. This is dead serious, and it's an actionable item. Less of an action item: what if the future generations actually build quantum Bayesian superintelligence, close enough in its capabilities to Solomonoff induction, at which point even a mummified brain or the one preserved in formalin would be enough evidence to restore its original state? Or what if they invent read-only time travel, and make backups of everyone's mind right before they died (at which point it becomes indistinguishable from the belief in afterlife existing right now)? Even without time travel, they can just use a Universe-sized supercomputer to simulate every singe human physically possible, and naturally of of them is gonna be you. But aside from the obvious identity issues (and screw the timeless identity), that relies on unknown unknowns with uncomputable probabilities, and I'd like to have as few leaps of faith and quantum suicides in my life as possible. So although vitrification right after diagnosed brain death relies on far smaller assumptions, and if totally worth doing - let me reiterate that: go sign up for cryonics - it'd be much better if we had preservation protocols so non-destructive that we could actually freeze a living human, and then bring them back alive. If nothing else, that would hugely increase the public outreach, grant the patient (rather than cadaver) status to the preserved, along with the human rights, get it recognized as a medical procedure covered by insurance or single payer, allow doctors to initiate the preservation of a dying patient before the brain death (again: I think everything short of information-theoretic death should potentially be reversible, but why take chances? ), allow suffering patient opt for preservation rather than euthanasia (actually, I think it should be done right now: why on earth would anyone allow a person to do something that's guaranteed to kill them, but not allowed to do something that maybe will kill, or maybe will give the cure? ), or even allow patients suffering from degrading brain conditions (e.g. Alzheimer's) to opt for preservation before their memory and personality are permanently destroyed. So that's basically that: the key idea is to freeze (and keep) everything under pressure. Now, there are some tricks to that too. It's not easy to put basically any animal, especially a mammal, under 350 MPa (which is 3.5x higher than in Mariana Trench). At this point even Trimix becomes toxic. Basically the only remaining solution is total liquid ventilation, which has one problem: it has never been applied successfully to a human. There's one fix to that I see: as far as I can tell, no one has ever attempted to do perform it under high pressure, and the attempts were basically failing because of the insufficient solubility of oxygen and carbon dioxide in perfluorocarbons. Well then, let's increase the pressure! Namely, go to 3 MPa on Trimix, which is doable, and only then switch to TLV, whose efficiency is improved by the higher gas solubility under high pressure. But there's another solution too. If you just connect a cardiopulmonary bypass (10 hours should be enough for the whole procedure), you don't need the surrounding liquid to even be breathable - it can just be saline. CPB also solves the problem of surviving the period after the cardiac arrest (which will occur at around 30 centigrade) but before the freezing happens - you can just keep the blood circulating and delivering oxygen. Speaking of hypoxia, even with the CPB it's still a problem. You positively don't want the blood to circulate when freezing starts, lest it act like an abrasive water cutter. It's not that much of a problem under near-freezing temperatures, but still. Fortunately, this effect can be mitigated by administering insulin first (yay, it's the first proper academic citation in this post! Also yay, I thought about this before I even discovered that it's actually true). This makes sense: if oxygen is primarily used to metabolize glucose, less glucose means less oxygen consumed, and less damage done by hypoxia. 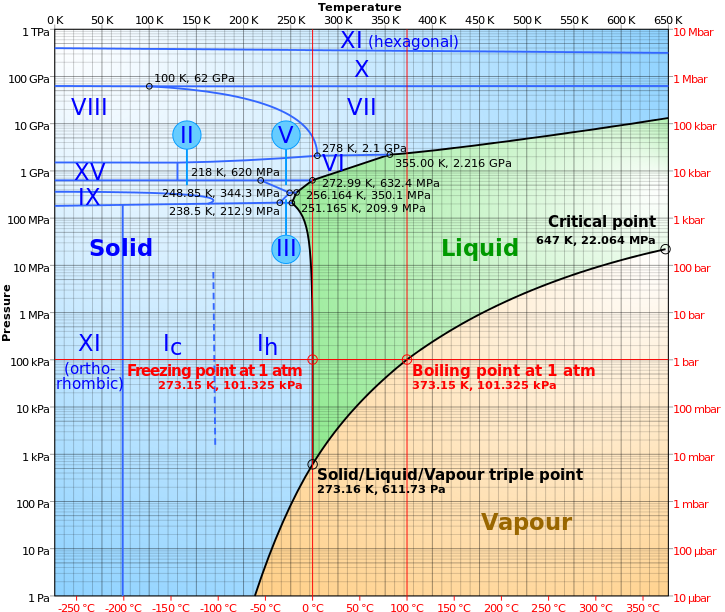 Then there's another thing: on the phase diagram you can see that before going into the area of high temperature ice at 632 MPa, freezing temperature actually dips down to roughly -30 centigrade at 209~350 MPa. That would allow to really shut down metabolism for good when water is still liquid, and blood can be pumped by the CPB. From this point we have two ways. First, we can do the normal thing, and start freezing very slowly, so minimize the formation of ice crystals (even though they're smaller than the original water volume, they may still be sharp). Second, we can increase the pressure. That would lead to near-instantaneous freezing everywhere, thus completely eliminating the problem of hypoxia - before the freezing, blood still circulated, and freezing is very quick - way faster than can ever be achieved even by throwing a body into liquid helium under normal pressure. Video evidence suggests that quick freezing of water leads to the formation of a huge number of crystals, which is bad, but I don't know near-instantaneous freezing from supercooled state and near-instantaneous freezing upon raising the pressure will lead to the same effect. More experiments are needed, preferably not on humans. Anesthetize a probably terminally ill, but still conscious person. Connect them to a cardiopulmonary bypass. Replacing their blood with perfluorohexane is not necessary, since we seem to be already doing a decent job at having medium-term (several days) cardiopulmonary bypasses, but that could still help. Submerge them in perfluorohexane, making sure that no air bubbles are left. Slowly raise the ambient pressure to 350 MPa (~3.5kBar) without stopping the bypass. Apply a huge dose of insulin to reduce all their metabolic processes. Slowly cool them to -30 centigrade (at which point, given such pressure, water is still liquid), while increasing the dose of insulin, and raising the oxygen supply to the barely subtoxic level. Slowly raise the pressure to 1 GPa (~10kBar), at which point the water solidifies, but does so with shrinking rather than expanding. Don't cutoff the blood circulation until the moment when ice crystals starts forming in the blood/perfluorohexane flow. Slowly lower the temperature to -173 centigrade or lower, as you wish. Raise the temperature to -20 centigrade. Slowly lower the pressure to 350 MPa, at which point ice melts. Start artificial blood circulation with a barely subtoxic oxygen level. Slowly raise the temperature to +4 centigrade. Slowly lower the pressure to 1 Bar. Drain the ambient perfluorohexane and replace it with pure oxygen. Attach and start a medical ventilator. Slowly raise the temperature to +32 centigrade. Apply a huge dose of epinephrine and sugar, while transfusing the actual blood (preferably autotransfusion), to restart the heart. I claim that this protocol allows you freeze a living human to an arbitrarily low temperature, and then bring them back alive without brain damage, thus being the first true victory over death. But let's start with something easy and small, like a shrimp. They already live in water, so there's no need to figure out the protocol for putting them into liquid. And they're already adapted to live under high pressure (no swim bladders or other cavities). And they're already adapted to live in cold water, so they should be expected to survive further cooling. Small ones can be about 1 inch big, so let's be safe and use a 5cm-wide cylinder. To form ice III we need about 350MPa, which gives us 350e6 * 3.14 * 0.025^2 / 9.8 = 70 tons or roughly 690kN of force. Applying it directly or with a lever is unreasonable, since 70 tons of bending force is a lot even for steel, given the 5cm target. Block and tackle system is probably a good solution - actually, two of them, on each side of a beam used for compression, so we have 345 kN per system. And it looks like you can buy 40~50 ton manual hoists from alibaba, though I have no idea about their quality. I'm not sure to which extent Pascal's law applies to solids, but if it does, the whole setup can be vastly optimized by creating a bottle neck for the pistol. One problem is that we can no longer assume that water in completely incompressible - it had to be compressed to about 87% its original volume - but aside from that, 350MPa per a millimeter thick rod is just 28kg. To compress a 0.05m by 0.1m cylinder to 87% its original volume we need to pump extra 1e-4 m^3 of water there, which amounts to 148 meters of movement, which isn't terribly good. 1cm thick rod, on the other hand, would require almost 3 tons of force, but will move only 1.5 meters. Or the problem of applying the constant pressure can be solved by enclosing the water in a plastic bag, and filling the rest of chamber with a liquid with a lower freezing point, but the same density. Thus, it is guaranteed that all the time it takes the water to freeze, it is under uniform external pressure, and then it just had nowhere to go. Alternatively, one can just buy a 90'000 psi pump and 100'000 psi tubes and vessels, but let's face it: it they don't even list the price on their website, you probably don't even wanna know it. And since no institutions that can afford this thing seem to be interested in cryonics research, we'll have to stick to makeshift solutions (until at least the shrimp thing works, which would probably give in a publication in Nature, and enough academic recognition for proper research to start).